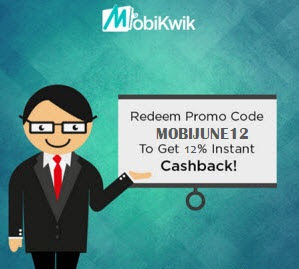 Mobikwik is giving Extra 12% Cash-back on Adding money to your Mobikwik Wallet from Credit or Debit Card. Open your Mobikwik App if you don't have....Install it from Here. Now Click on "Add Money" Option. Put Amount as Rs. 200 or More. Select Payment Mode Credit/Debit Card & Enter your Card Details. Now put Coupon Code "MOBIJUNE12" & Apply it. After Successfully Applying.... Complete the Payment. You'll get Extra 12% on your Added Amount. Offer Valid Only on Mobikwik App. Offer valid on Debit/Credit Card only. Minimum Amount to be added is Rs. 200 & You can get upto Rs. 100 as Cashback. Copyright 2015 @ Tamal Basak. Powered by Blogger. Your One Place Destination to all kind of Tips-Tricks, Deals, Coupons, Offers, Givaways, Recharges and several things. Recharge Panel always tracks Online happenings much faster than other. There's a lot of Hard Work being involved behind The Recharge Panel Project. So it's a kind request to you to support us. And be with us. Thank you guys. You are the Inspiration.